My parents are currently in Europe. I know, it was a coincidence that both families planned to go to Europe in the same year. As you can imagine, before they left we compared lots of notes. As ‘mature’ travellers (yeah, we’re the immature ones) they have quite a different itinerary and pace. Although they politely admired our Rick Steves carry on bags, they maintained they didn’t mind taking bigger suitcases and not having to cart their bags onto the plane. Well, we are currently piecing the story together from SMS messages and emails but the gist of it is that my Mum has lost her bag. They flew from London to Paris. The airline didn’t loose the bag – another passenger picked up Mum’s bag by mistake. When he realized the mistake, he contacted my Parents (who were half way to Germany by that stage) and returned the bag to security at CDG Airport. My parents drove back to CDG to retrieve the bag but it couldn’t be located. I don’t want to get too smug because all our travel disasters have yet to happen. 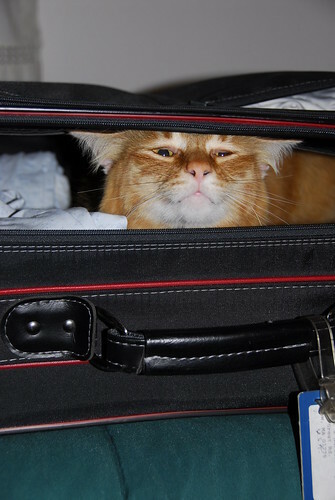 We need to wait until we get back before we can truly say that carry-on is a better way to go. In the meantime, it’s certainly sounding less crazy. Ok, I couldn’t stand it any more. I HAD to get a gizmo. The gizmo of choice today was the balanzza digital travel travel scales. I found them for a good price at Office Works. One of the things I get very nervous about when travelling is the weight of our bags. Keptwoman emailed me this and suggested it would be a really good thing to get. I’m afraid that kind of ruins her reputation as the anti-enabler, but here is my new toy. Today we are giving our packing lists and bags a good work out. We’re off on a homeschooling camp to Wymah Valley retreat. 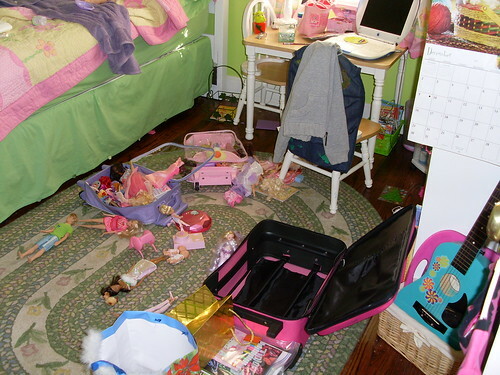 In fact, I HAVE to go check the little girl’s bag right now. Perhaps we can have a practise run packing the imaginary babies while we are at it. It’s a more industrial beast than I had imagined. It weighs in at 3.4kg. On the bright side, it might not break the first time we get onto the plane. On the downside, the Flight Crew might dummy spit about it. [amtap amazon:asin=B0006GCZZQ] If you read the review that goes with it – the person who bought it totally loved it but gave it two stars. Gotta love the way that happens on Amazon. Folded up it is small enough to fit into one of our bags – as long as that bag was only about half full to start with. Although I was extremely taken with the sayings on these ones at Anne Taintor. Do you think they’ll mind if I just stick in one piccie? And then there are these ones with an entirely different message. The thing I hate most about air travel. Other than the “fear of death” thing, obviously. Ok, so I don’t have a mono-brow. But I really, really hate travelling without tweezers. I’ve been scouring the Airport, Airline and TSA websites. It looks like Melbourne Airport is still stricter than the TSA regulations. TSA will let you fly with blunt scissors – I suspect Melbourne will still confiscate anything metallic. Bah!!! Note to self: if I manage to find pink shiny Italian tweezers I MUST post them back to myself from the UK!!!! One-Page Packing Checklist :: One Bag. He doesn’t like wheelie bags as an option either. So I guess we are on the right track. And whadda ya know, he has details of the “bundle wrapping” technique for packing. [amtap amazon:asin=1580087833] The sub title of “The Packing Book” is, “secrets of the carry-on traveller”. I bought it partly because of this by-line but also because I’m a sucker for a good list. While a lot of the information is a avaliable places like the Rick Steves website, I have picked up a few handy tips. The first was a different brand of fold up luggage cart. We’d decided on the Samsonite micro mover but I was having trouble finding one. I was actually extremly relieved to read that the author, Judith Gilford, recommended luggage carts, as I was having second thoughts about our choice of wheel-less luggage. The brand Gilford recommends can carry two to three times as much weight wise. I’m watching one on eBay at this very moment. 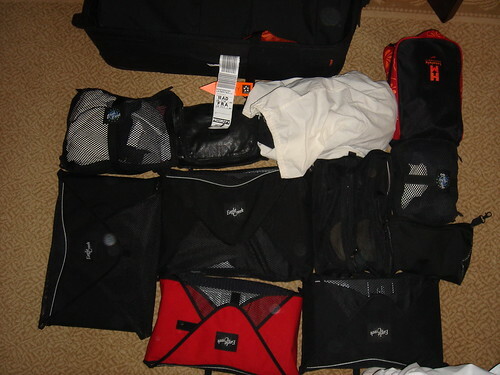 Gilford also has a great packing method called ‘the bundle method’. This looks like it will work really well. If you want to know how this works, you’ll have to get the book. Happy Box Day to us! In Homeschooling land, box day is when the boxed curriculum you ordered finally turns up in the mail. Our box day was a little different – all of our Rick Steve’s luggage turned up! It kind of counts as curriculum materials seeing as it is going to contribute to the education of the Applets, right? We decided in for a penny, in for a pound with the Rick Steves luggage. We wanted to be able to maximise the amount of packing space, while keeping things light. We also hope it will last us a while and that one day the Applets may use it to do their own tours of Europe. The second box – full of goodies! It wasn’t until I had the slate blue bag on my bag that I suddenly realised how very Star Trek the colours of the bags are. How appropriate for boldly going!